“Since 2000, more than 20 custom-built paraSITE shelters have been distributed to homeless individuals in New York City and Baltimore. 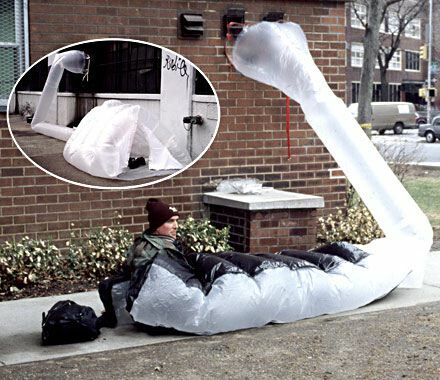 Made with materials — such as plastic bags and tape — readily available on the streets, paraSITEs start out looking like small packages, and have handles enabling users to carry them on their back. 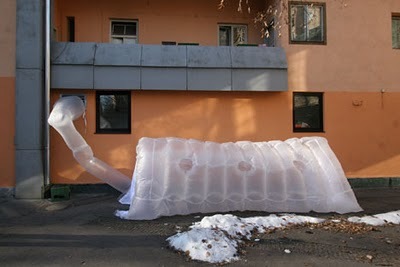 Designed by Michael Rakowitz, the paraSITE units inflate into shelters. The user simply attaches the intake tube to the outtake ducts of a building’s HVAC system. The warm air leaving the building then inflates and heats the double membrane structure.